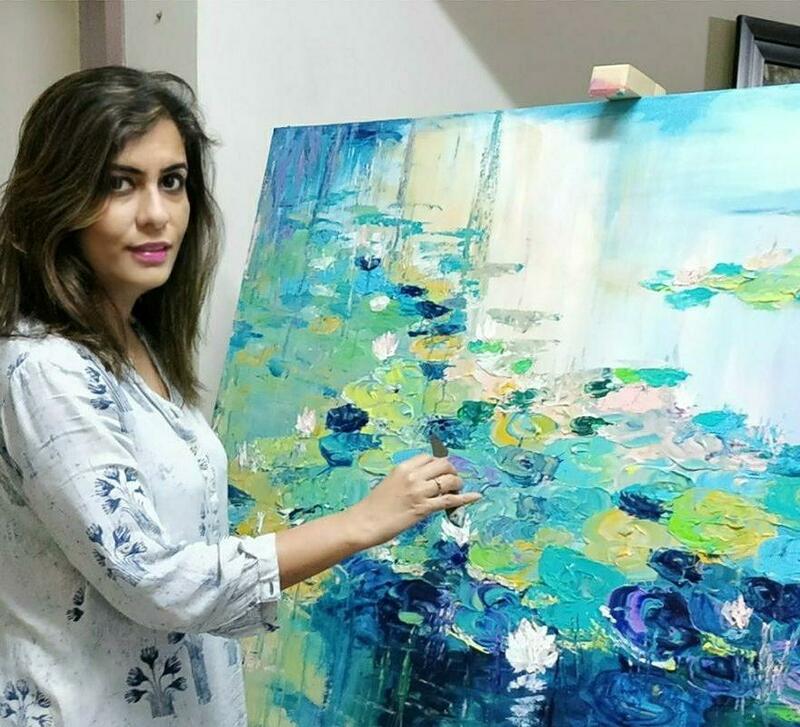 My most recent work comprises a series of floral, water and peacock paintings on canvas that are all inspired by my grandpa’s garden in Jaipur that does not exist anymore. Bougainvillea and bright yellow Amaltas (also known as Cassia Fistula) blooming in the summer months in India take me back to the memories of relaxed summer holidays of my childhood. They remind me of love, home, family and fun. The architecture, fabrics, handicrafts and gemstones provide Jaipur with a myriad of colors labelling it famously as the Pink City of India. Incidentally, pink is one of my favourite colours when I paint lotuses and lilies. 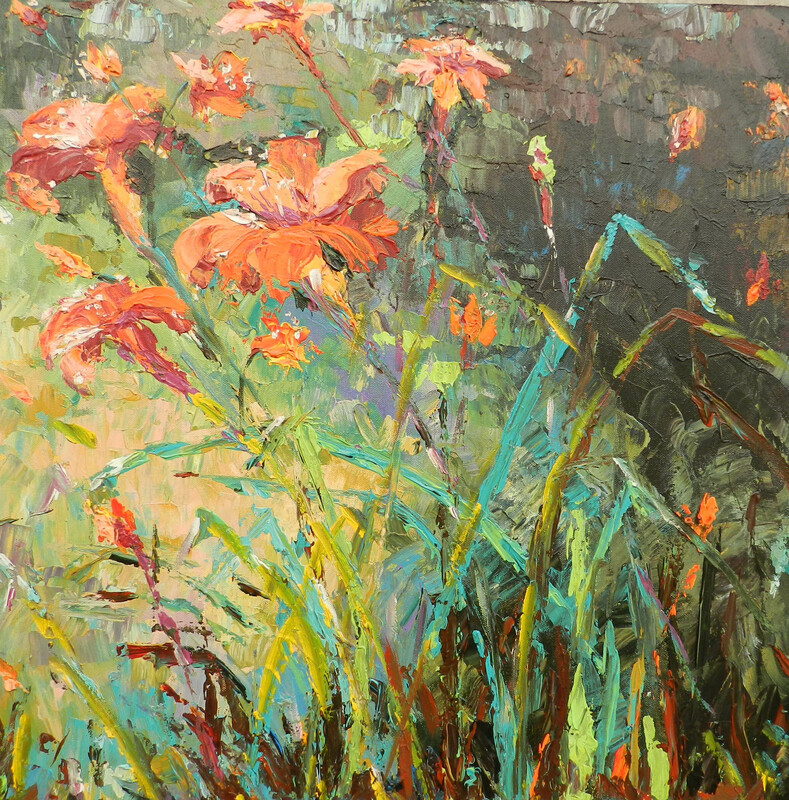 Lilies are such captivating blooms both in the garden and on the canvas. If only I could capture their subtle fragrance! None of my water paintings feels complete without the lotus. 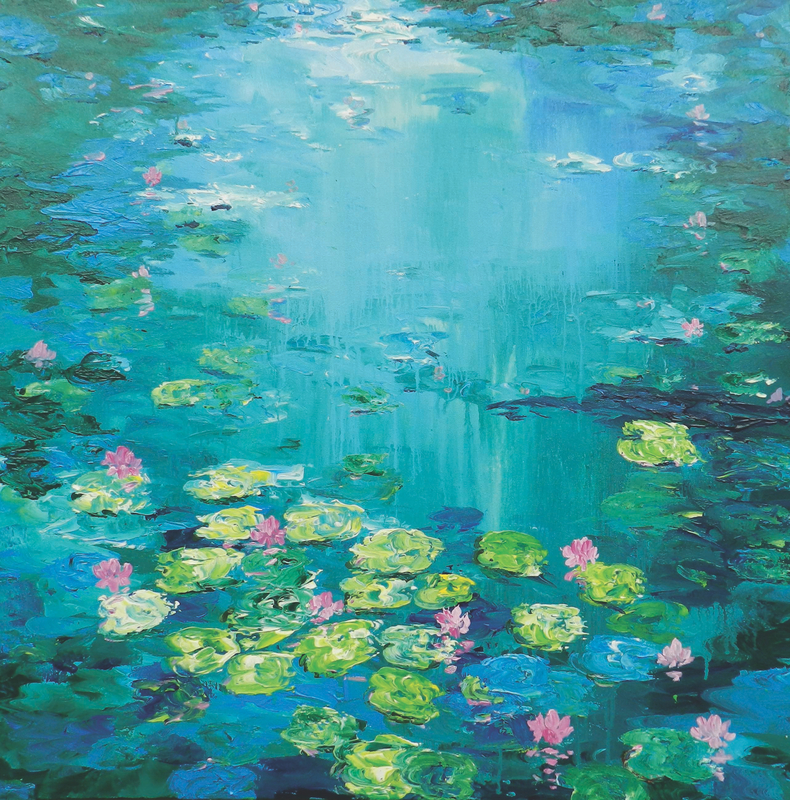 One that is close to my heart is the Blue Tranquil which is a waterbody with floating lotus leaves and flowers. I have created a special light effect using bold strokes and layers of paint to depict how the water shines in the early morning hours. One can gaze at this painting for hours as the light effect is energising and if you are a water lover you might almost want to dip your feet in! Cold water and a gust of breeze were very welcome during the arid Rajasthani summers. So were the peacocks. Towards the end of summer, my grandpa’s garden was frequented by peahens and peacocks who added a touch of grace to nature’s greens and blooms. 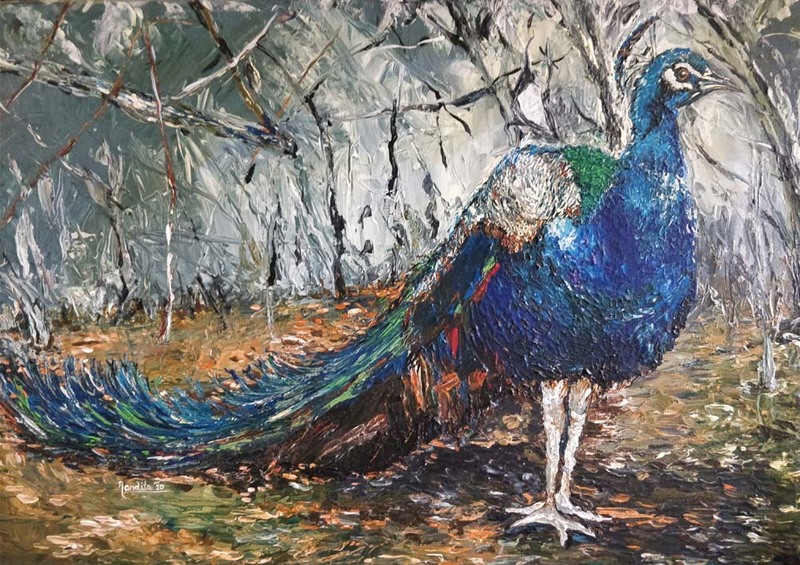 I have done a whole series on peacocks as the bright blue colour of the bird’s plumes can uplift a tired spirit in seconds. I was born and brought up in Jaipur but moved to New Delhi after my undergraduate studies. 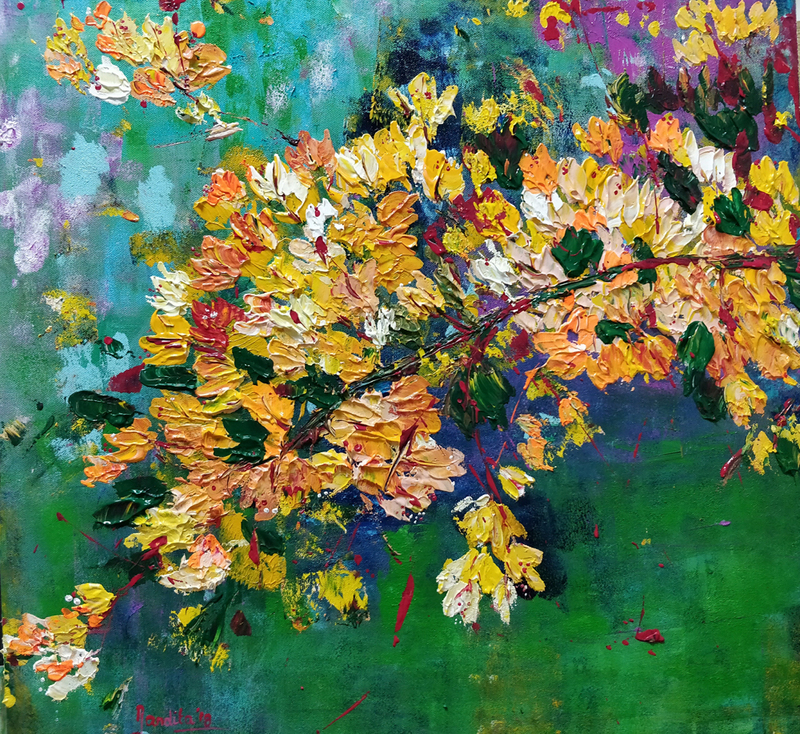 I graduated from the Delhi School of Art and have been painting for two decades now. I am a die-hard nature lover as depicted in my paintings. I paint using my imagination and memories. I do not paint what I see, but what I want to see. My formal training during my college years and the critique provided by my talented teachers help keep me disciplined about form and scale while the appreciation of art lovers lends me new wings to experiment further with textures. I work with a palette knife and acrylic colours on canvas using the impasto wet-on-wet technique. My biggest influence while studying art history in college were the Impressionists. Claude Monet’s style was critical to Impressionism as he defied traditional norms and painted in the open air capturing natural light in such a way that the same landscape appeared differently at dawn, mid-day and dusk. 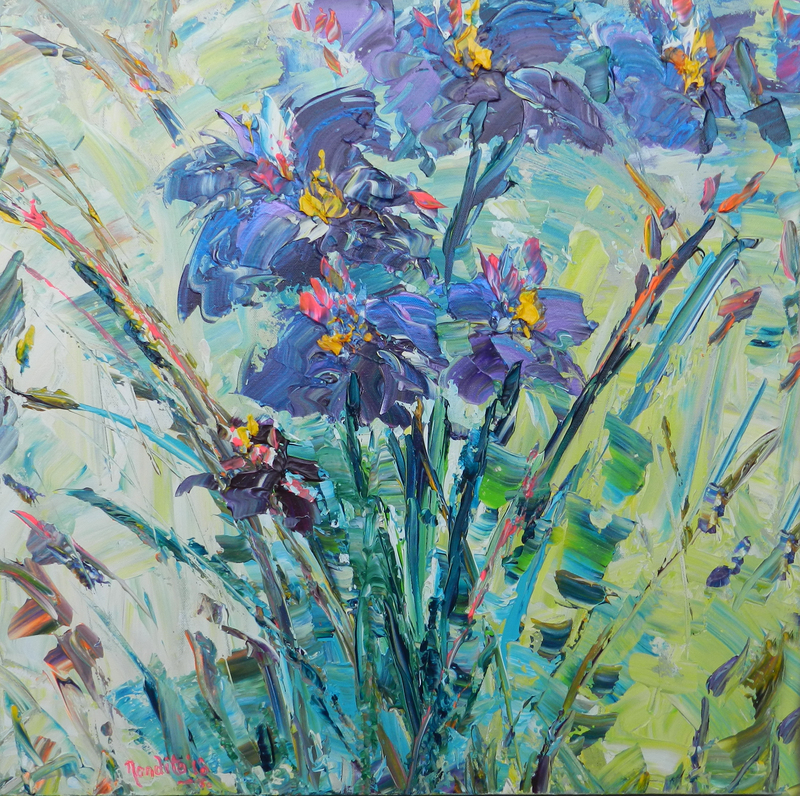 I find the portrayal of colour and light in his Giverny paintings to be particularly intriguing. I also found Vincent Van Gogh’s style to be fascinating. He was known for his bold and dramatic brush strokes full of emotion. It is believed that he often used paint directly from the tube, an impasto technique for applying a thick layer of paint. Today, a large multi-storied building stands where my grandpa’s garden used to be. I not only miss watering his plants and tending to the saplings but also sitting in that open space surrounded with nature’s beauty. I currently live in an apartment and endeavour to bring the outdoors in with my paintings. I hope their lifelike form will inspire everyone to plant more trees and grow more flowers in the face of growing construction in Jaipur, New Delhi and other cities in India. For now, I hope my paintings take you on a trip down memory lane in your own dream garden. 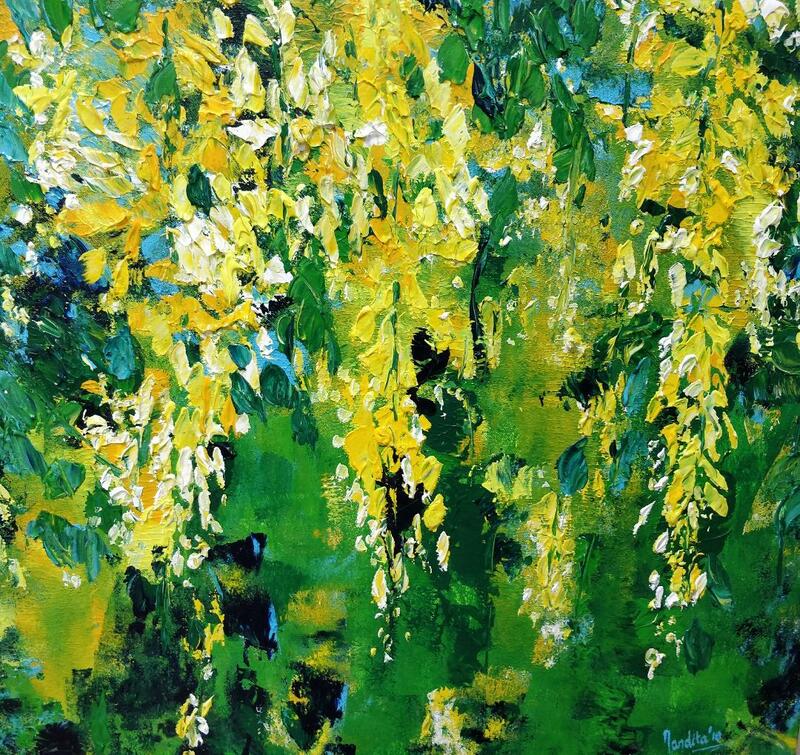 Email us if you are interested in purchasing any of Nandita’s artwork.